Some areas of the world show evidence of a prior civilization that was capable of before-their-time feats. 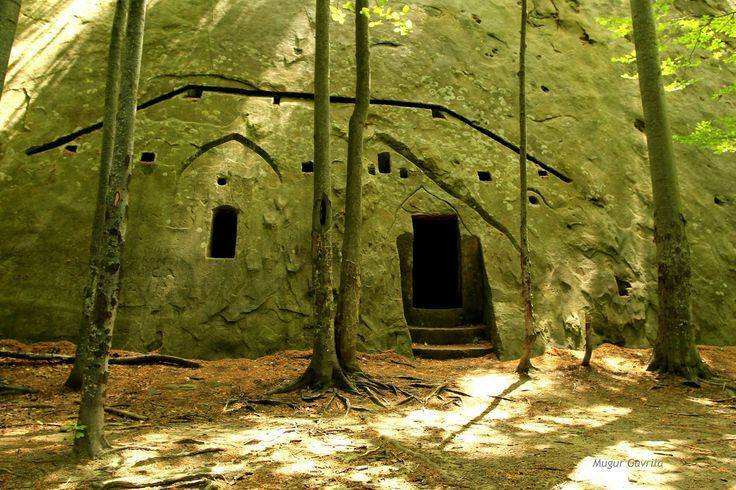 Romania is rich with such history and the legends that support this civilization's past presence. The Pyramids of Sona (above) are classic mounds and mound building has been found around the world. These 8 mounds are near the Transylvania area near the Faragas Mountains (which have a legend of prior giants). Locals call them guruieti and believe they were raised by giants. The legend says that many years ago, this land was ruled by a princess named Sona. One day her kingdom was attacked by some giants who came over the Fagaras mountains. The giants have gone through the water of Olt river, and when they arrived in this place they shook the mud from their feet and created these mounds. Another legend says that they date back from Dacian times and that treasures were buried inside them. There are also numerous caves in one area, some natural, some carved out of stone. All were used by people over various times periods. About 300 AD, monks began to use these as places to pray and hide away, but who originally used these sites? 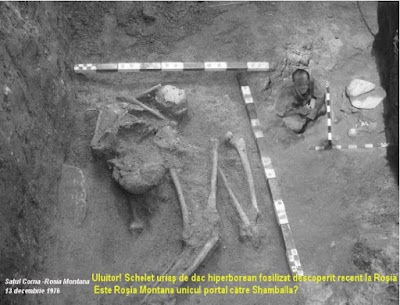 (SOURCE LINK) In the 1940’s, archaeologists were overseeing a dig at Argedava in Romania, searching for priceless artifacts within the ruins of what was once the greatest citadel of the Dacian leader Burebista. The locals did most of the digging and they were glad to be making a little extra during those times of hardship. Among them was Ionita Florea, now an old man well in his eighties. He was the one who dug up an enormous skull, two or three times the size of a regular one. When he notified the archaeologists, the workers were quickly dismissed and the researchers resumed the digging themselves. Their findings were loaded onto trucks and shipped away with the utmost secrecy. By the end of the excavation, they had collected around 80 skeletons, most of them complete. They had also recovered giant ceramic pots filled with grains. To this day, nobody knows where the skeletons are. Beneath Corna Valley, a dig site referred to by some as the "Hyperborean Gallery" or "Gallery 13" was uncovered in 1976 with giant finds. "...Then I saw the horror. Archaeologists had dug out of the rock a giant skeleton about 10 meters long, lying on one side with its legs raised...."
In that magical way that legends of old carry nuggets of events, told in a mystical way in which to inspire generations to pass it on, there are many legends in Romania of the giants. (SOURCE LINK) Knowing the local legends, people from the area immediately thought about the tartars. One of these legends even claims that the mountain formation known as the “Pillars of Tainita” (“Stalpii Tainitei”) had actually been built by these giants of old. In the past, the giants were also credited for building two large underground halls somewhere beneath the mountain. 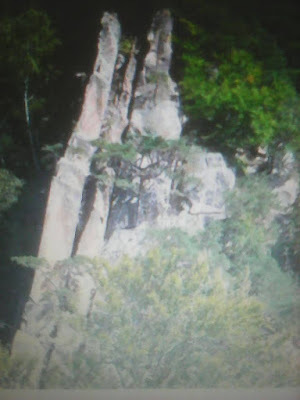 The strange formation which can be seen up on Tainita Mountain resembles a set of stone chairs. As they are found at high altitude and in a highly inaccessible area, locals claim that tartars built the chairs to sit on when they wanted to gather for council. Caves and mining seem to be a huge common factor in the giants locations. Romania would seem to have plenty of those, as well as ancient legends to support yet another "giant" culture coming from the mountains. This high-altitude factor might come in handy explaining these giants, as the Denisovans molars and finger bone found in a cave in Siberia showed that they had huge teeth, strong jaw to support it and carried DNA to handle high altitudes, a gene they reportedly gave the Sherpas of the Himalayas in their DNA.